Who is already thinking about Christmas 2013?! Well, we should be! If you want to save hundred of dollars, take action now! It’s the “off-season” for Christmas shopping and the stores want to get rid of all their holiday merchandise to make room for the fully priced Valentine’s, St. Patrick’s Day and Easter items. So take advantage of them and shop now. A few years ago I ran into a store and had “accidentally” (God’s little surprises) ran across the Christmas aisle. 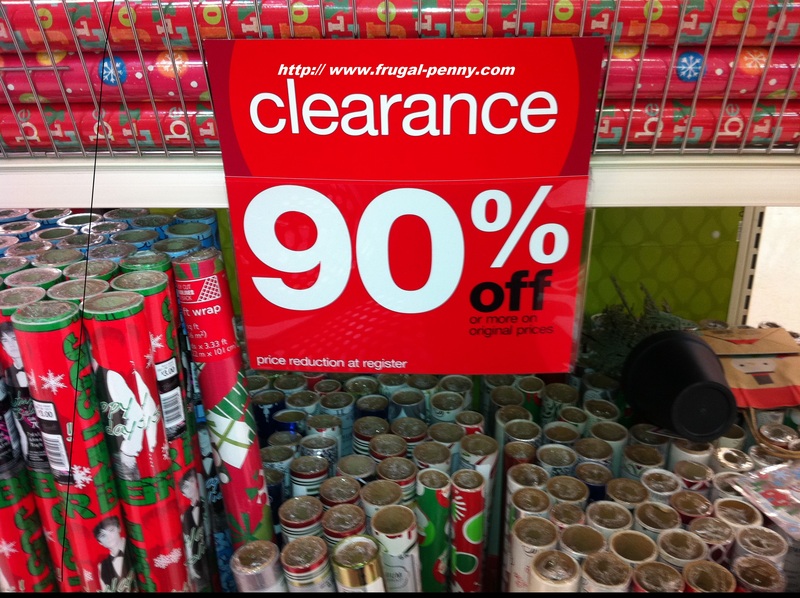 It was January and everything in that aisle was 90% off! I bought gift bags, tissue paper, gift sticker labels, gift boxes and more! I think I spent $10 on everything. To this day, I still have that tub of supplies that I use for Christmas. This morning I ran into JoAnn’s to pick up something for one of my speaking engagements. I suddenly saw the green and red sparkling at me out of the corner of my eye. Above those holiday colors was a sign that said “90% off everything!” Yes!!! I joyfully headed over to the aisle and wisely spent less than $10 for everything. 1) Call the stores ahead of time. Instead of driving to all of the stores and spending money on gas, make a list and call them. See if they have a Holiday (Christmas) clearance aisle. Then ask them how much the items are marked off for. Once you have your list of stores, then make your route to the cheapest places. 2) Make a list of items you might need. Instead of buying everything because it’s so cheap, buy what you need. We always attend an ornament exchange party with our friends and need ornaments as gifts each year. I found ornaments that were originally marked at $14.99 and only paid $1.49 for them! Other ornaments were $9.99 and I only paid $0.99! I felt like I was stealing these beautiful ornaments. Make purchases for your work party, kids’ school events, teacher gifts, etc. Plan ahead on things that you might need this next Christmas season. 3) Scan the aisle for items that can be used outside of Christmas (or whatever holiday is on sale). Look for things that can be used any time of the year. For example, I purchased rolls of beautiful purple ribbon for only $0.29/roll. I can use this fabulous ribbon anytime of the year. Don’t just buy something because it’s 90% off, but if you’ll really use it then it’s a great deal. Therefore, if you want to save hundreds of dollars, then learn how to master your off-season shopping. Plan your attack and get shopping!. Learn how to stretch your dollar so that you can purchase more and still save TONS of money! « Winner Of The Dream Big Contest!